The shortlist of three designers bidding to create a stained glass window in memory of the Very Revd Jeremy Winston has been chosen. Twenty four fellows and associates of the British Society of Master Glass Painters responded to the challenge of creating what will be one of the most important stained glass in Wales since the end of the Second World War. Caroline Benyon Caroline served an apprenticeship with her father, the Stained Glass artist Carl Edwards, painting his design for the Great West Window of Liverpool Anglican Cathedral. She is a Fellow of the British Society of Master Glass Painters, an accredited conservator & restorer (ICON Institute of Conservation), the present Chairman of the BSMGP and a member of the Court of Assistants of the Worshipful Company of Glaziers. Benjamin Finn Benjamin is based in a Friends of Friendless Churches church producing new stained glass works for churches, houses, schools and for exhibition, and repairing and restoring glass in the East Anglian region. Helen Whittaker Helen has won several awards including a commission through the Stevens Competition run by the Worshipful Company of Glaziers and Painters of Glass. Helen is a visiting tutor for the Prince of Wale’s School of Traditional Arts. Her MA thesis was on Jesse Trees. “It was very difficult to draw up the shortlist because of the quality of the proposals”, said Fr Mark Soady, successor to Fr Jeremy Winston as Vicar of Abergavenny. “But our chosen designers will now be able to take the project to the next stage, producing a design sketch by mid-July. From that we will make our final choice design for the window,which we then hope will be completed by the Summer of 2014″. The cost of the window will depend on the final design but through local fundraising and grants, the appeal is estimated to have reached about 70 per cent of the amount needed. “The window will provide a fitting memorial to my predecessor and will be much more than a work of art as we will be able to incorporate it into the prayer life of then church, and use it for Bible study and so much more”, he added. 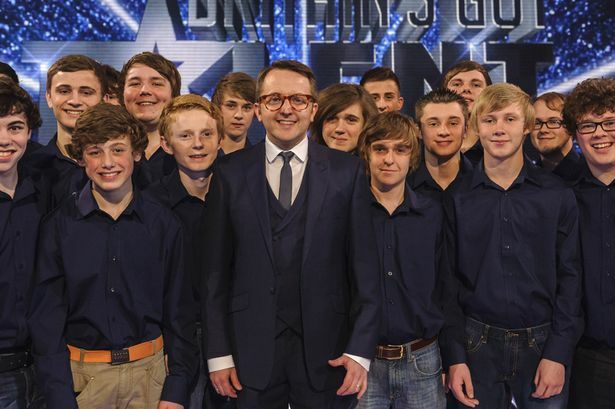 Only Boy’s Aloud are to perform in aid of the Jeremy Winston Memorial Appeal. Very few tickets remain for the Concert at the Borough Theatre, Abergavenny on May 11th with Eastern Valley members of the world famous choir Only Boy’s Aloud and local artists. Easter Day Holy Eucharists will be celebrated by two Bishops. 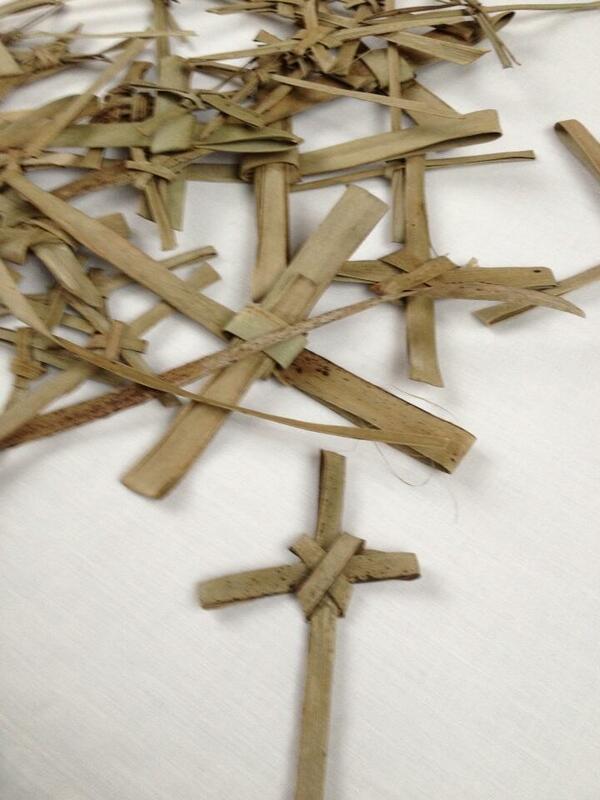 In addition to having a Bishop from the Province of South Africa (The Bishop of St Helena) in action we will be using Palms on Palm Sunday from the Province. The Palms kindly donated by our link Parish of St Dunstan’s Cathedral, Benoni in the Diocese of the Highveld, where grown in South Africa. 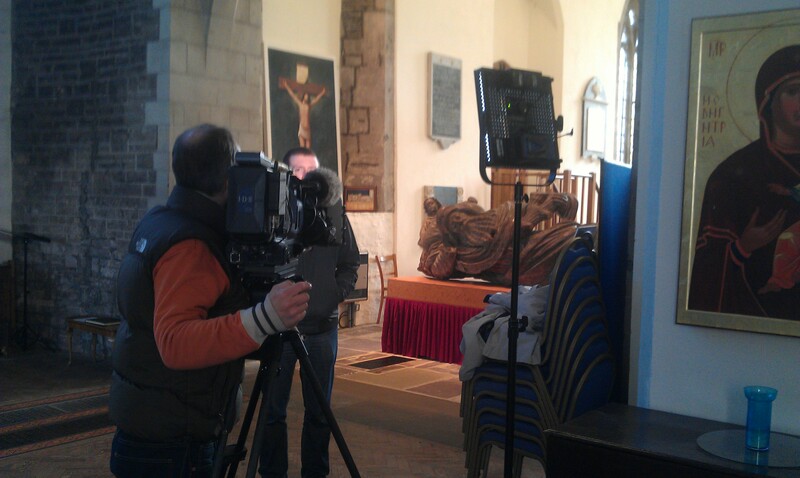 We are pleased to be one of the venues for an Exhibition of the Methodist Christian Art Collection Risen! :Art of the Crucifixion and Eastertide. This exhibition of important paintings from the Methodist Church collection of contemporary artists will open at other venues at the end of March and at St Mary’s Priory Church on April 2nd (and close on April 19th). This work was commissioned in autumn 2009 and accepted into the Collection in early 2011. It owes its origin to the wish of two benefactors to sponsor a work that demonstrates the readiness of Jesus to take a non-judgmental stance. Here he questions the assertion that the woman should be stoned by questioning the right or even the worthiness of any one in the crowd to cast the first stone. They are all themselves sinners and by implication, if the woman deserves to die, they are worthy of death themselves. But Jesus came to save sinners not to condemn them. He does not condemn the woman. So, she is told to go away and sin no more. It is when people know that they are not condemned, that they are accepted as they are, that they often find the resources to change their way of living. There are still two Sunday’s left in our series of Lent Sermon’s on One Church One Faith One Lord. On March 10th Fr Robbie Dennis will reflect on his time serving as a Priest in South Africa. And a week later Dr Bernard Sixtus will look at his time growing up in Germany and serving as Assistant Curate in the Anglican Chaplaincy in Paris, under the title Christianity in Central Europe. The series started with Dr Will Ingle Giliss telling us that Christians in the US are less reserved than in the UK.He pointed out that while America is a Christian country its laws prevent prayers at school. Bishop Dominic said a little about the history of Christianity in India and a little more about the Mar Thoma Christians in Kerala, who of course claim to trace their root back to St Thomas who went there in 54AD. He showed the cultural link between the dress and liturgy of Christianity there and Hinduism. Today Prebendary Sam Ashton shared with us the concerns of Christians in the Middle East. In his Pastoral letter read on the Sunday before lent the Bishop quoted St Paul who wrote of the Resurrection as being at the very heart of the Christian life. He said, If there is no resurrection of the dead, then Christ has not been raised, and if Christ has not been raised then our proclamation has been in vain and your faith has been in vain. If Christ has not been raised, your faith is futile and you are still in your sins….. If for this life only we have hoped in Christ, we are of all people most to be pitied. It is this resurrection hope that we shall celebrate at the end of the month at Easter. It is this hope that sets us Christian’s apart and keeps us going when things appear dark and gloomy. The period since the Bishop’s Pastoral letter was read has not been an easy one, for it was also on that day that Dr. Bernard Sixtus decided to leave us to join the Ordinariate. I would like to pay personal tribute to him for his wise council to me, and for the Priestly and pastoral way he has cared for all Anglicans in Aberagavenny. This is not the first time that Anglicans have considered going to Rome I am currently reading the new biography of Archbishop Cosmo Lang, by Robert Beaken. There it is recorded that after Parliament threw out the 1928 Prayer Book the Archbishop worried that Anglo-Catholics may defected to Rome in large numbers. Yet nearly a century later the Anglican Church is still here in all its guises. I am strengthened by the message of Christian hope and by the fact that Jesus gives us a cross to bear- but not one that is too burdensome. That is the spirit in which we must go forward. Bernard’s departure will mean changes, I hope we are all open to these changes. As Lent moves forward I pray that it continues to be a time of renewal and discernment for us all – and pray that when it comes you will have a Blessed Easter.